"Gold Dust Twins" and is by Dr. Leonard J. Nyberg, Jr. - W1LJN. (According to my log on 3/3/56 I was in QSO with W1LJN when I heard a series of shouts ... then nothing. After reading this account I now know what happened so many years ago. It was during the spring of 1956, more precisely the 3rd of March; I can remember it as if it was just yesterday. It had been a particularly cold winter and the January "thaw" really didn't amount to much more than three or maybe four days with temperatures above the freezing mark. This night was even colder and windier with snow coming down at a rate of at least six inches per hour. Our cabin was pretty well stocked up with food, drink, plenty of wood and one of those new gasoline generators so we didn't have too much to be concerned about. Both of us were retired so it really didn't make a hoot if we were stuck for a week or more. Anyway, we had one of those new fangled motorized toboggans that they now call "snow machines" so if we really had to get out we could. My friend Bert and I had finished supper at about 6:30 and Bert was relaxing in front of the fire with a hot toddy in his hands and his stocking feet stretched out in front of him. He was the epitome of relaxation just stretched out idly, almost asleep, watching the shadows from the fire dancing along the walls of the cabin. I was intently trying out my new Collins KWS-1 Transmitter and 75A-4 Receiver which I had recently purchased; the pair was really expensive but they were the rage of my fellow hams at the time. When the pair arrived last week, via Leroy Andrew's delivery truck, Bert remarked to Leroy, as he helped bring the boxes in, that the transmitter must have weighed about five or six hundred pounds or more and the receiver wasn't very much lighter. Of course this was an exaggeration but Bert always liked to exaggerate. Bert had been a woodsman for the better part of his life and was used to hard work and heavy loads but I guess that the weight of the cumbersome freight boxes reflected on his advancing years. Of course Leroy was a strapping young man and built like a battleship, and had no problem with his end of the load. I had never in my life experienced hard physical labor, and contributed by supervising and judicially staying well out of the way. Well, after a couple of days we got the transmitter and receiver set up and ran the transmitter into a 500 watt light bulb that I had used for a dummy load; boy, did that bulb light up brighter than can-be before it exploded into a couple of million pieces. "I think I've got it Bert" I exclaimed. Bert agreed and remarked that he had nary a doubt relative to my electronic capabilities and commenced to clean up the glass fragments that covered a good portion of the floor next to my radio table. Since Bert was so experienced with trees I had him climb up a big Hemlock that towered about ninety feet or so from the snow covered hill behind the cabin. "A little higher Bert", I ordered; Bert climbed about as high as he could and set the pulley and rope that I had given him. We repeated the procedure again on another tree and hauled up a 150 foot wire antenna between the two giant Hemlocks. I ran a ladder line from the center of the antenna down to the peak of the roof of the cabin and then inside to the transmitter and receiver. After I had attached the antenna lead-in I held my breath while firing up the two radios. At first there was a lot of static and then after a while came in the voices of hams from various parts of the world. Well, you can imagine my excitement when I grabbed the shiny D-104 microphone and shouted CQ, CQ, CQ this is amateur radio station W1XYZ transmitting from our cabin in the far north of the US of A; can anybody out there hear me? I listened intently for a reply and with nothing heard tried again…..and again…..and again. Finally, I got a reply from a fellow in England. Can you imagine that; all the way from the frozen north of the US of A to England - why that's clear across the ocean from here. Well, of course Bert was not impressed at all and just sat there stretched out on his Morris chair sipping his hot toddy. He did, however, remark that he could hear the English fellow very clearly and thought that the clarity was indeed attributed to the quality of the receiver that I was using and that big speaker with the fancy chrome covered light fixed atop of it. Although Bert was not a ham he had a good ear for that type of thing; after all, he had worked all his life in the woods and had to listen for wild animals and the like; so, I always took him at his word when it came to audio quality. As I have previously described, the weather this night was particularly brutal. The wind was howling a gale and the snow was coming down at an unbelievable rate. Between transmissions I had looked out the front window and saw that the snow had come over the lower part of the windows on the first floor and was accumulating fast. I remarked to Bert that ".. I'll wager that it won't be long before the snow is over the windows and up to the front porch roof." Bert silently nodded his head in agreement and totally unconcerned placed a couple more logs on the fire before retreating back to his Morris chair. About nine o'clock or so I heard what I thought was the rumbling of an avalanche, Bert thought the same thing. I looked outside again but the windows were so completely covered with snow I couldn't see a damned thing. There had been no flashes of lightning so it probably wasn't thunder, but then we both heard the awful thunderous sounds again. This time it came- BANG, BANG, BANG - THUD, CRASH!!! Bert leaped up from his chair spilling the remains of his hot toddy on the floor - I reacted about the same. The crash came from the front peak of our cabin and we both fully expected to see a tree branch or even an entire tree coming through the wall or roof or perhaps it was an avalanche and the roof was caving in. You can imagine our surprise when we both saw that a thousand pound moose had bulled his way through the exterior wall of our cabin right into our living room. Bert thought that he must have been going "a hundred miles per hour or more with the wind behind his back, I agreed. "Good thing that the snow was as high as it was", I remarked, "or he would have come clean through our front door". I got on the phone and called Doc Jones, the local vet, and described the situation to him. "Well, I can't come out tonight," responded Doc, "but I'll try to get out there in the morning- just feed him some carrots and a little lettuce if you have some and he should be OK for the night." Doc did come out the next morning but was unable, even with our help, to free the moose from the hole that he had made in our front wall. The best we could do is put the poor animal out of his misery, after several hundred pounds of lettuce and carrots, of course. 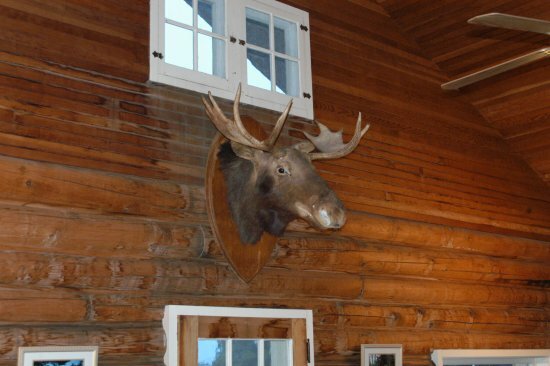 We kept the head part in the cabin as a reminder and even constructed a fancy neckpiece to kind of set off the head and make it appear that it had been professionally done; I'm certain the moose would have liked that. I wondered if the reason for the intrusion was because of the high winds and extreme weather but Bert insisted that it was most probably "the outstanding Collins 75A-4 receiver audio that attracted the big fellow and prompted the crash". I guess that I'll just have to agree and go along with Bert's assessment because Bert had a good ear for that kind of thing and the Collins folks had a reputation for making quality electronic equipment. That "A-4" with the fancy lighted speaker certainly sounded good to me too.